Apart from the superb sandy beaches located around the Penzance coastline, there are plenty of further tourist attractions to keep even the most difficult to please visitor happy. Amongst the most popular attractions around Penzance, Land's End is particularly famous for its westerly location and is now home to the action-packed 'Legendary Destination' attraction. One of the most exhilarating ways to view Penzance is by air, and a trip to the neighbouring Isles of Scilly on a British International Helicopter is hard to forget. 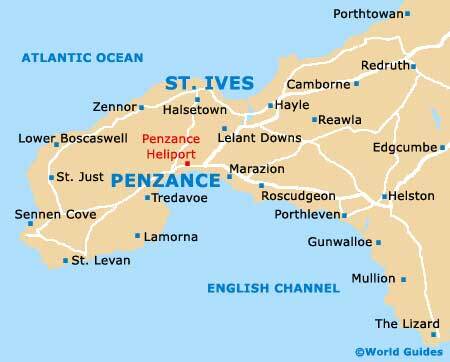 The beautiful golden sandy beaches around Penzance, Land's End, Marazion, Porthcurno and Sennen have long been major draw cards for the area. With countless beaches available with a range of attractions, the award-winning coastline around Penzance is one of England's cleanest and suitable for sunbathing, swimming and a number of water sports. 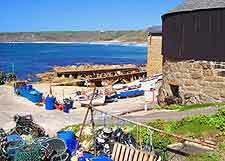 The main beach here stretches eastwards from Penzance Harbour and right up to Marazion, encompassing Mounts Bay. Also worth noting, close to St. Michaels Mount is a charming, small beach centred around Mousehole Harbour. Most prominent Cornish beaches feature a team of lifeguards during the summer months. On the south-western side of Penzance and close to the village of Sennen, Land's End is a world-famous location and home to some of the country's most breathtaking scenery and coastline. Land's End is the most westerly point of England and is known for its superb views of the Atlantic Ocean. 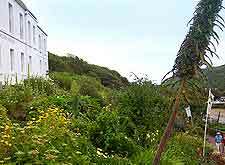 This part of Cornwall is extremely popular with tourists staying in Penzance and as a result, is full of family attractions, most of which can be found at the Legendary Land's End theme park and around. 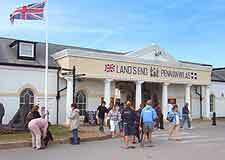 These attractions include a visitors centre, numerous photo opportunities alongside Land's End signposts, the 'Return to the Last Labyrinth' multimedia experience, the Air Sea Rescue Motion Theatre, a new Doctor Who exhibition, and also the Wreckreation Adventure Play Area, which is always popular with children. Also worth a visit is the Cornish Sweet Manufactory, where you are able to watch demonstrations of how sweets were once made. An important part of life and tourism in the Penzance area, the British International Helicopters provide an exciting and extremely memorable way to reach the nearby Isles of Scilly. The journey lasts less than 20 minutes and offers breathtaking aerial views of attractions along the way, such as St. Michael's Mount, and is used by both tourists and locals on the isle of Scilly alike. Operating at the Penzance Heliport, the British International Helicopters service is one of the best ways to appreciate the beauty of south-western Cornwall's coastline and numerous coves. Sited on the side of a cliff in the nearby town of St. Just, close to Penzance, the Levant Mine boasts Cornwall's most historic beam engine, amongst other steam attractions and electric engines. In full working order after an extensive restoration programme, the engine was used to power much of the mine machinery, when both tin and copper deposits where collected underneath the sea, more than 1.5 km / 1 mile from shore. The Levant Mine is now owned by the National Trust and was is operation from the mid-18th century right up to the 1930s. Free park is available on-site. 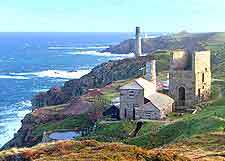 Located in the small village of Pendeen, just a short distance to the north-west of nearby Penzance, the Geevor Tin Mine is known for being one of the biggest and best preserved mining locations in the whole country. The Geevor Tin Mine stands close to the coastline, directly above St. Just, and the many eye-catching surface buildings and attractions here can be explored. With regular videos, a mineral gallery, and a museum area full of historic attractions and mining artefacts, the Geevor Tin Mine was in operation more than 200 years ago and ceased production in 1990. Guided tours of the narrow underground tunnels are available, while a gift shop and highly regarded cafe with coastal views complete the main attractions.